At OXUS Group, we measure our success by the results we achieve for our clients. A growing list of OXUS Group’s clients, including the United States Government and several Fortune 500 companies, have taken advantage of our core services and first-class capabilities in the areas of government solutions, capacity-building and training, technology services and solutions, business development, and community engagement. OXUS Group has achieved a reputation in Afghanistan for superior performance and enterprise-saving solutions during social and political crises, complex situations, and other difficult conditions. Under the leadership of a former Ambassador to the United Nations from Afghanistan, our impressive management and technical consultants bring together highly-qualified teams for each project aimed to client success. OXUS Group brings unparalleled capability to its services through a combination of proven local and international expertise that allows us to develop innovative solutions for our clients. We are strengthened by our management team’s western education and their personal experience in Afghanistan’s complex political and national security environment, with native-level understanding of language, culture, economy, and social issues. We maintain a current network of similarly-experienced advisors and Subject Matter Experts (SMEs). Our advisors and SMEs are higher-educated, and have served in public and/or private sector leadership roles in the U.S. and Europe across OXUS Group’s core technical areas. Additionally, our technical teams are enhanced by with regional team experts, which provide strategic perspective into political and social issues impacting our project, while also offering direct access to communities and national level decision makers. OXUS Group senior advisors serve as a bridge to western diplomatic and military missions, and international organizations. They work closely with our technical teams to provide guidance and support, helping the teams integrate effectively with their counterparts in ministries, as they introduce new ideas, new approaches, and new systems to enhance client success. Afghanistan remains the core focus of our company. OXUS Group maintains an impressive presence throughout Afghanistan. We actively support sustainability and stability efforts through community and business efforts. OXUS Group’s operational centers include our Headquarters (HQ) in Kabul, and a Presence in all 34 Afghan provinces. OXUS Group HQ maintains over 120 personnel, including Afghan retired military and police generals, high level security experts and SMEs with PhDs and master’s degrees from top western universities. Our presence in the Afghan provinces consists of performing training and capacity-building projects. These projects are managed by Afghan retired generals, business leaders, former parliamentarians and community leaders in these regional localities. Our strong and highly-educated professional staff in Washington, D.C. provides direction and support to our Afghanistan operations. This ensures that U.S. best practices, values, and ethics are consistently applied throughout our business operations. Our distinguished U.S. team consists of Major General Arnold Fields (retired, Special Inspector General for Afghanistan Reconstruction – SIGAR), Mr. Edward Walter Koenig (former Senior Commercial Officer at U.S. Embassy in Kabul and executive of various corporations), and Mrs. Veneece McNeley (a retired U.S. DoD director with 37 years experience in DoD contracts/acquisition, including a mission/tour in Afghanistan as a senior advisor). OXUS Group U.S. officials provide effective oversight of our Afghanistan teams’ progress, to ensure most efficient organizational outcomes and enhanced programs. 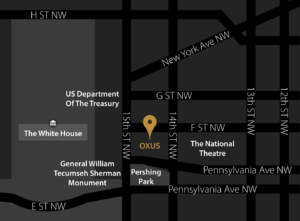 OXUS Group’s HQ in the U.S. is conveniently located in Washington, D.C., across from the White House on Pennsylvania Avenue in the historic Willard Hotel’s Office Building. We are within close proximity to all U.S. governmental agencies and number corporate HQs. OXUS Group implemented U.S.-funded programs to support institutional development for Afghanistan’s Ministry of Defense and Ministry of Interior. We recruited more than 120 internationally and highly-educated, Afghan and American advisors to train, advise and assist in building the operational and strategic capabilities across five functional areas in each Ministry, including: (1) Finance/Resource Management, (2) Procurement, (3) Logistics, (4) Information Technology and (5) Human Resource Management to improve ministerial effectiveness. In each functional area, OXUS Group advisors trained, advised, and assisted ministerial leadership and supporting staff to enhance technical and managerial proficiencies. We engaged with each functional area’s ministerial staff through: training; advisory and assistance at the strategic and operational levels to improve human capital and information management, decision making, procurement of goods and services, financial management, capability building, capacity building, and enterprise process improvement; and direct support through studies and analysis of skills and knowledge gaps and processes. In support of improved transparency, accountability and oversight at the Ministries, OXUS Group has provided to the client, over 600 special reports (recommendations, process flow maps, analyses, technical assessments, and corrective action plans). Additionally, we trained well over 1,300 senior ministerial personnel in Kabul, and throughout all 34 Afghan provinces, to include areas where Afghan government officials have not been able to travel. OXUS Group used a continuous, capacity-building process of conducting technical assessments, analyzing data and information, developing corrective action plans, and providing customized training programs for defined target groups throughout the aforementioned functional areas. This approach provided a solid framework for long-term cooperation with key stakeholders, as well as stability and sustainment within the Ministries. OXUS Group continuously received praise from the RS leadership for providing such in depth and rich information to the coalition forces in Afghanistan. In support of the U.S. Embassy’s Economic Development Efforts, OXUS Group successfully managed programs to identify, train, and develop Afghan business executives across various industry sectors, including – agribusiness, carpeting, construction, construction material, and mining to increase business capacity. The project’s objective was to increase business and corporate capacity, develop key business and ministerial relationships in their respective sectors, improve human resource procedures, capital infusion, supply-chain management, and open new domestic and international markets to Afghan executives. Through an U.S.-Afghan economic development program, OXUS Group provided business capacity training and investment promotion services to over 85 senior executives of leading companies in Afghanistan. We worked closely with each Afghan executive to identify and expand their professional capabilities and commercial skills through strategic planning, marketing and participation in trade delegations. OXUS Group offered strategic business planning and training seminars, capacity-building study tours, as well as individual counseling sessions for program participants. In total, the team provided 192 one-on-one counseling sessions, 300 business-to-business meetings, 16 structured training events, and led eight international study tours across the industry sectors to Japan, Singapore, Germany, India, UAE, and Turkey. OXUS Group has built a local team and developed the necessary international partnerships to effectively implement complex Information Technology Solutions. Most recently, OXUS Group was awarded a major contract to install state of the art communications infrastructure to a major Afghan Government Ministerial campus. This project includes the complete installation and testing of all required in-building wired and wireless communications, building interconnects via a campus wide fiber optic network, all required active communications components, and to create a Data Center. This complex project also requires an aggressive schedule to align with early occupancies. OXUS Group efforts in Afghanistan has contributed to bringing power and improved irrigation across the country to more than 200,000 residents. OXUS Group developed a successful consortium with leading international power and water companies, and local Afghan service providers. As team facilitator, OXUS Group led in identifying and securing opportunities, as well as vetting qualified and trustworthy local subcontractors acclimated with the intricacies of provincial zone relations, government relations, community engagement and overall mitigation of risk. Our team has also successfully performed on major projects that addressed design and build of hydropower plants, substations, transmission lines, and irrigation systems. Through our efforts, OXUS Group supported the economic revitalization of Afghanistan by drawing major international companies in, to enter key business sectors in Afghanistan. The industrial sectors that OXUS Group attracted in its endeavors, included the market entry and expansion of international firms in Afghanistan across power, construction, mining, agriculture, manufacturing/textiles, information technology, hospitality, and media. We have provided a wide range of business development through in-depth analysis, advisory services, and field assistance. OXUS Group cultivated local and international business opportunities through its rich network of high-level contacts throughout Afghanistan. For improved situational awareness, OXUS Group provided specialized assessments on the local cultural, political, and historical significance of selected business sectors and enterprises. The assessment also included analysis of tribal and cultural influences in certain industry sectors, and the project’s leaders and participants. OXUS Group has supported companies such as Google, YouTube, JP Morgan, Morgan Stanley, Chevron, IBM, Fortune Magazine, Hyatt Hotels, Kate Spade, The Warren Buffet Foundation, and Emaar Properties. OXUS Group co-hosted and organized a series of major investment promotion summits in Dubai titled, “The Afghanistan Summit.” These Summits were tailored to expand private and public sector partnerships, and aid essential reconstruction and development initiatives underway in the region through promoting Afghanistan as a viable investor and business destination. Each event attracted over 400 participants. Participants were involved in business networking and educating prospective investors of opportunities in Afghanistan across critical economic sectors including security, construction, logistics, mining, information technology, and agriculture. The event participants included Afghan Government cabinet-level representation, U.S Government senior officials, and representatives from major international corporations, Afghan companies, NGOs, Canadian government, DFID, KFW, World Bank, Asian Development Bank, IMF, U.N., NATO, and various trade associations. The three day conferences consisted of special panels for each sector, roundtable discussions, one-on-one meetings with decision-makers and technical experts, and multiple open networking receptions and business luncheons. The OXUS group has a very deep understanding of the multicultural Afghan business environment and effective relationships with government officials at all levels. These relationships allow OXUS Group to effectively engage in all regions of Afghanistan, regardless of logistical challenges or security concerns. This unique capacity is brought to bear in all of our projects. For our clients, this results in significant reduction of implementation and financial risk.